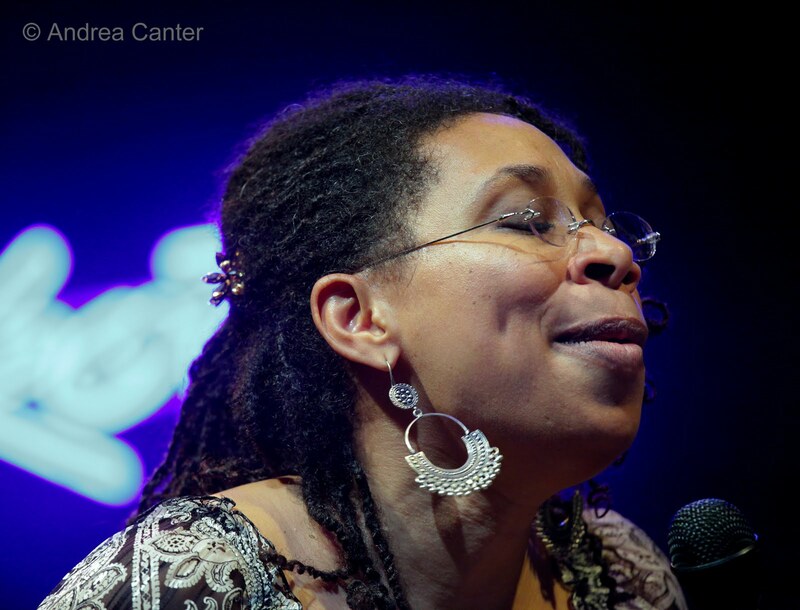 Dakota owner Lowell Pickett noted that there were no words to describe vocalist Rachelle Ferrell. Maybe that’s true. Or maybe all words describe her. There may be no sound in music, and no human emotion, that she can not deliver—not only conjuring every instrument in a symphony orchestra or every voice in a gospel choir, but the ghostly scraping of a creaky hinge, the chilling power of an avalanche, the life-affirming squeal of a newborn baby, the spattering pops of artillery fire, the delicate call of a bird or the fury of a charging elephant. In any key, in any interval within those six broad octaves. And she can shift that sound, that pitch, in a mere split second, twisting her mouth into myriad shapes that seem to pull each nuance directly from her heart. Over the course of a set running more than two hours at the Dakota May 6th), one imagined a gene pool of Sarah Vaughan, Betty Carter, Nina Simone, Abbey Lincoln, Aretha Franklin, Bettye LaVette, Minnie Riperton, and most certainly Bobby McFerrin. With surprise guest, percussionist Sheila E, Rachelle traded some soulful commentary before E. took over the trapset. 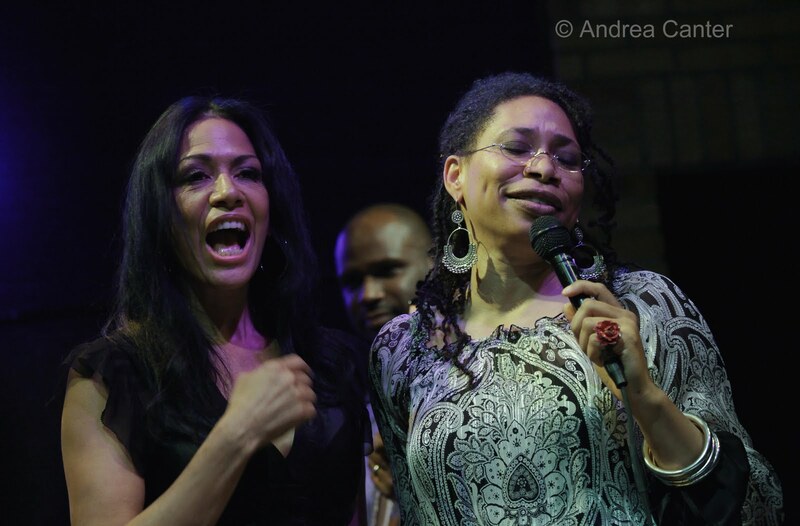 Soon the band dropped out, leaving Sheila and Rachelle to carry on one of the liveliest of musical conversations, a lengthy debate seemingly between two percussionists, each daring the other to have the last word, to match and surpass the last response. Author Dom Cerulli (The Jazz World), speaking of Ella Fitzgerald, noted that “she seems to be unaware there are things a human voice just doesn’t to. She does them.” Rachelle Ferrell now takes the human voice beyond even Ella’s dreams. 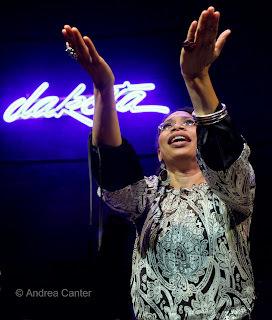 Photos: Rachelle Ferrell (and with Sheila E) at the Dakota, May 6, 2010. 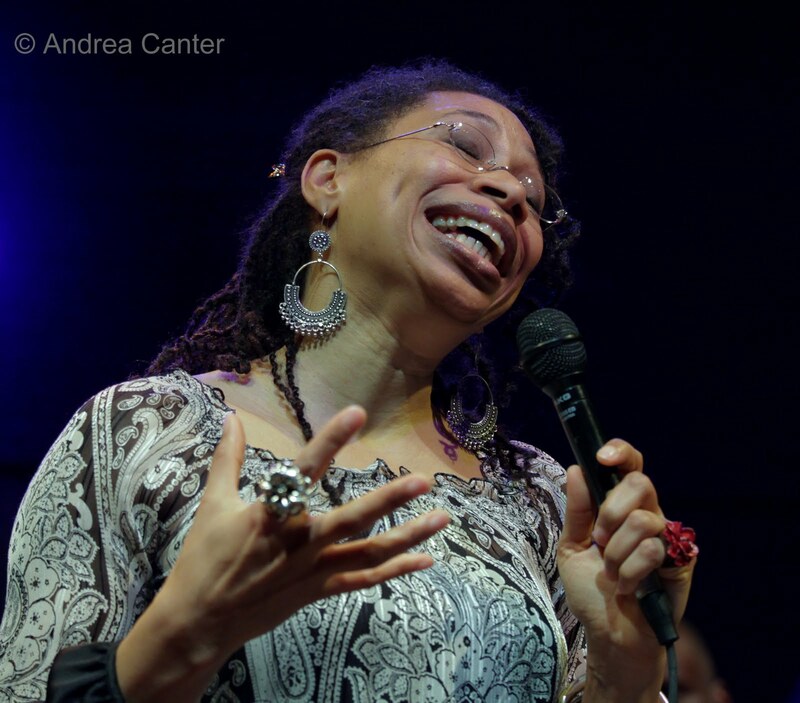 Photos by Andrea Canter.